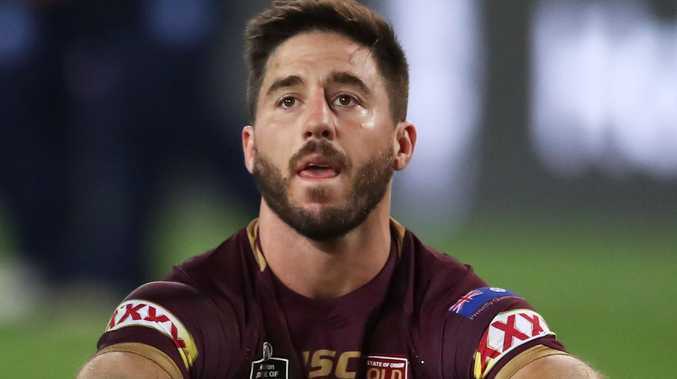 SOMEWHERE in between all the talk of football tragedies like losing games and injuries, Kangaroos star Ben Hunt silently suffered the kind of raw, real heartbreak that only happens away from the football field. Hunt's wife Bridget revealed recently the couple suffered a miscarriage earlier this year around the Dragons' season-opening win over the Broncos on March 8. In a year where Hunt's form and reported $1.2 million per-season contract made him one of the most criticised players in the game, his young family's heartbreaking revelation adds another tragic element to his season from hell. Hunt revealed last month he had been receiving advice from a psychologist to confront anxiety and isolation issues. He was - unfairly - the face of Queensland's State of Origin series defeat. It was all crashing down on him. 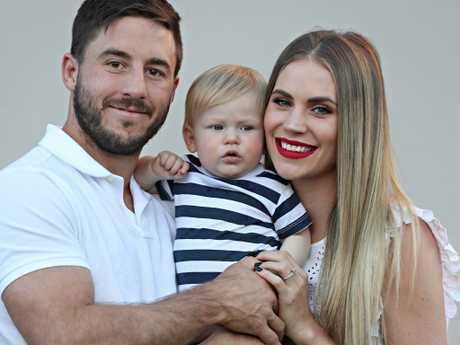 Ben Hunt, son Brady and partner Bridget. When NSW clenched the series in Game 2, Hunt was ruthlessly criticised and attacked on social media for his mistake in kicking the ball dead when Queensland attacked late in the game - and for his mistake in giving away a penalty try for a professional foul on Boyd Cordner. Former Queensland teammate Johnathan Thurston called it "dumb football". Former Broncos teammate Justin Hodges was one of many calling for Hunt to be dropped after Game 2. Fox League NRL 360 host Paul Kent labelled him the "Mitchell Pearce" of Queensland. He was eventually dropped to the bench for Game 3. The social media response was much more vicious. Bridget's announcement recently that she suffered a miscarriage at 12 weeks seems to make all that football talk of form, points and representative jerseys immaterial. Suddenly, the Dragons halfback's form fluctuations are understandable. Vindicated. Unquestionable. Bravery only tells part of the story of Hunt's commitment to play through his personal tragedy and help steer the Dragons to the second week of the playoffs, while earning Queensland and Australian representative honours. 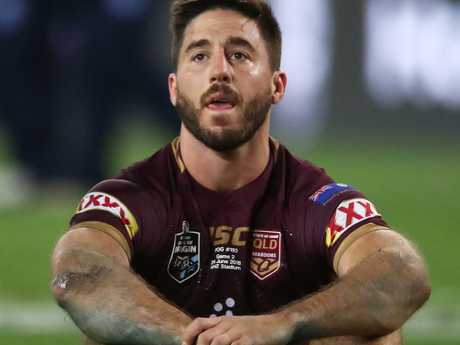 Ben Hunt after the Maroons’ State of Origin Game 2 loss. Bridget's post on Instagram shows Hunt had more important things than shields and Maroon dynasties on his mind going into this year's State of Origin period. "2018 has been filled with a multitude of challenges for our family," Bridget posted. "In feb we were excited to be announcing that our family was growing by 2 feet, however unfortunately miscarried at 12 weeks. "Its always hard in those situations to think, what could I have done differently? What did I do wrong, what it was that I did to impact the result? Sometimes, things are just meant to be - and it was hard to focus on the positives when you are experiencing emotions of grief, sadness, loneliness and so many questions that no one had the answers too." The post also shows the difficulties the couple faced during the NRL season when they were having problems conceiving. After the Dragons' form dipped after the State of Origin period and the early season leaders dropped to seventh on the ladder, Bridget hit out at her husband's critics in an emotional social media post where she fired back at the "despicable bullying" he was receiving. "Words have meaning! You may not think they affect the person, but they have meaning!" she posted on Instagram. "It's funny, that Ben is apparently being blamed for the Dragons' performances of late, but it's funny, last time I checked it's his first year at the Dragons, and this has happened three years in a row. And it's funny that there's 17 people in a whole side, yet it's all his fault! "Players make errors when they are loosing [sic], and players make errors when they are winning too! Rugby league should not be condoning this culture!" Ben Hunt after the Dragons’ season-ending loss to the Rabbitohs. Her recent Instagram post was much more heartwarming. The young couple first received word in September that they are expecting their second child - and son Brady, 2, will soon have a sibling to play with. The first stages of Bridget's pregnancy played out in the middle of the Dragons' finals series where Hunt starred in their upset win over the Broncos before their defeat at the hands of South Sydney the following week. "We then began trying but month after month, being disappointed over and over I began to question my integrity as a nutritionist altogether," Bridget posted. "This is my job to help people through such struggles, yet here I was living it myself. all of this amongst football challenges and personal attacks being launched at Ben weekly, our backs have been against the wall and needed some separation from negativity and from the people who write hurtful things that have no consequences because the person isn't in front of you. "To say it's been challenging would be saying the least, but resilience and character are built under pressure... and positive things always come with patience." Bridget says they are due on April 13 next year. That's really all that matters.